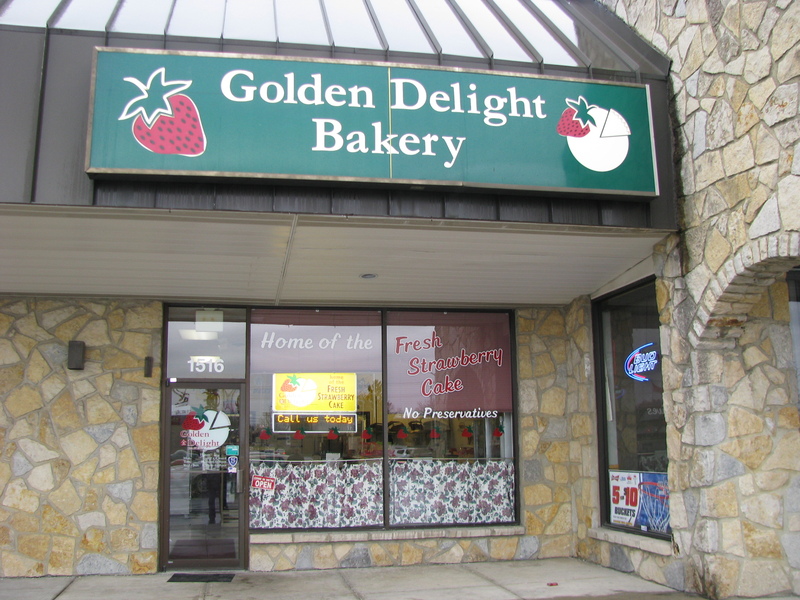 If you are exploring the Bethel Road area for an alt.eats adventure, a great place to satisfy a sweet tooth is Golden Delight Bakery. Known far and wide amongst many ethnic communities for their light and fluffy fresh Strawberry Cake, this Chinese (by way of the Philippines) bakery also offers a dizzying array of individually sized sweet and savory treats. The cakes are Golden Delight are less like cake and more like a pillow-y souffle complemented by an equally light whipped icing. For a quotidian treat, cake rolls are $7.95 and for special occasions (weddings included! ), cakes range from a diameter of six inches to large sheets. 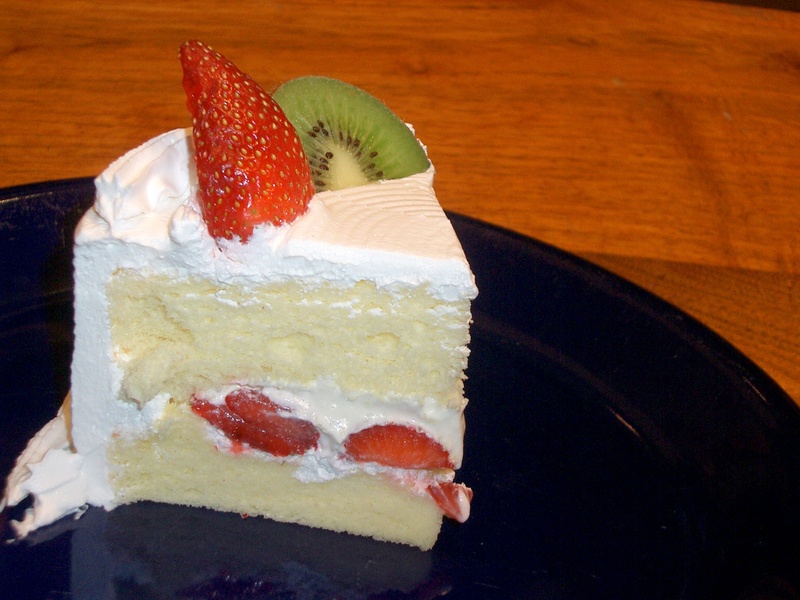 The fresh strawberry cake is the most popular but there are other flavors such as mango mousse, mocha cappuccino, and taro. Golden Delight offers a myriad of Cantonese styled pastries great for a breakfast on the go or an afternoon snack. Above left is a coconut pastry with yeasty, lightly sweet bread swirled with light caramel and toasted coconut flakes. Above right is a hot dog supreme, a sweeter take on pigs in a blanket. Of course, there is also the quintessential barbecue pork pastry. Golden Delight has two varieties, the fluffy steamed bun, and the above, a braided pastry filled with sweet and savoury barbecue pork. These are addictive! At a little over a dollar a piece, there’s no reason not to stock up on the small buns, a couple more: above left, ham and egg, with a generous squeeze of mayo; above right, melon (which doesn’t actually contain melon), filled with a light custard and is named for the sweet crumb topping. If they are available, definitely try a taro bun! In addition to its exhaustive list of pastries, Golden Delight also offers steamed buns (veggie, pictured above, sweet red bean, pork, pork and mushroom). As a testament to how popular these buns were, we were only able to snag a veggie bun. Filled with rice vermicelli, shiitake mushrooms, cabbage, and generously seasoned with black pepper, it was both satisfying and delicious! If you have any room left, don’t forget to pick up a couple cream puffs, egg tarts, almond cookies, and sweet loaves of yeasty bread (mixed with cinnamon raisin, coconut, taro, or red bean). It’s impossible to go wrong with any of these delicious treats. There is always a steady stream of business for cake orders and snack buns. Two of us here at alt.eats may have polished off an entire six inch strawberry cake, without sharing. And others of us may have scarfed four pastries in one sitting, in the name of taste testing. Yes, these baked goods inspire immoderate nomming and we aren’t one bit ashamed of it. This entry was posted in Asian, Bakery, Chinese and tagged Bakery, barbecue pork buns, Chinese, hot dog buns, pastries, strawberry cake, taro buns. Bookmark the permalink. Yum. The sweet red bean dumplings are reason enough to make the trip and taste some for myself. Thanks for giving us so many great foodie finds. STEAMED BUNS!!! Sold. I’d like one of each *right now* !! They made our wonderful wedding cake and my nephew’s too! 🙂 Great texture and flavor in their signature strawberry cake and their other items are great too! There is another location in Gahanna as well. Great strawberry cakes. The older woman at the Bethel location was very rude and I will not be back. I have found another place that has the same cakes and pastries called Ichiban Bakery. They are very nice.